Today's post is just showing off a little: as promised last summer, TECHknitting has a new pattern published in a nationally distributed magazine. Specifically, Interweave Knits Holiday Issue contains a TECHknitting pattern for stuffed mittens, made a new way. These stuffed mittens are loosely knit in the main color, using worsted weight yarn. Once the mittens are finished being knit, they are turned inside out for stuffing. Although these look like thrummed mittens (which have the tufts knitted in) adding the tufts afterwards makes it easier to add more of them: unlike when they're knit-in, tufts added afterwards don't interrupt the knit fabric's structure. Made extra large to accommodate all that stuffing, they are offered in sizes C,W,M (child's small and medium, as well as women's and men's). 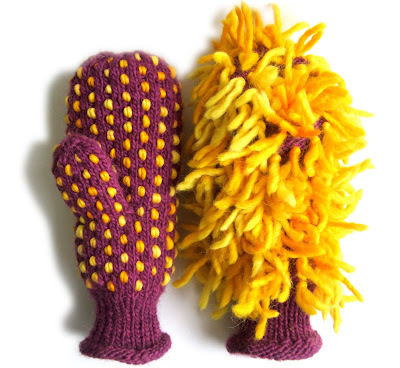 The child's medium mittens featured here and in the magazine are knit from Brown Sheep yarns: the main color is Lamb's Pride worsted Mulberry M162, the contrast color tufts are Lamb's Pride bulky Prairie Goldenrod M240. The fuzzy mitt to the right in the bottom picture is inside out, to show what the tufts look like once they've been fastened into place. As you can see, stuffed mittens are massively insulated. For kids, they would be perfect for a snowball fight. For adults, these would be handy to keep in the car for when you have to scrape the windshield or touch the freezing metal of the gas pump--good for yourself and a great gift for anyone who drives in the cold. Interweave Holiday Gifts magazine is currently on sale nationally until December 10, 2012, and is also available in a digital version. The copyright will revert to me by next year, at which time TECHknitting will publish the pattern (all four sizes). However, if you don't want to wait that long, you might like to check your local newsstand or library for the instructions. 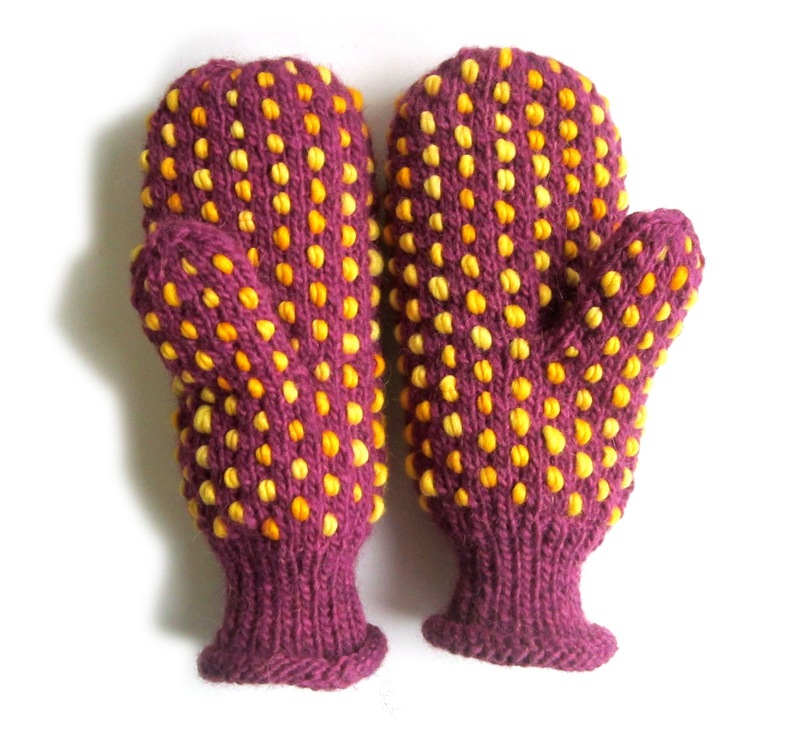 Here is the Ravelry link to see other photos of these mittens. Coming up next post, more in an Interweave Knits theme. In the winter of 2010, Interweave Knits published an TECHknitting article on installing zippers in knitwear, a new non-sewing way. Although this blog has referenced that article and the accompanying video, the full text has not been reprinted until now. The copyright has reverted to me, and the very next post will have the full text and illustrations of that method. Free on the web at last.